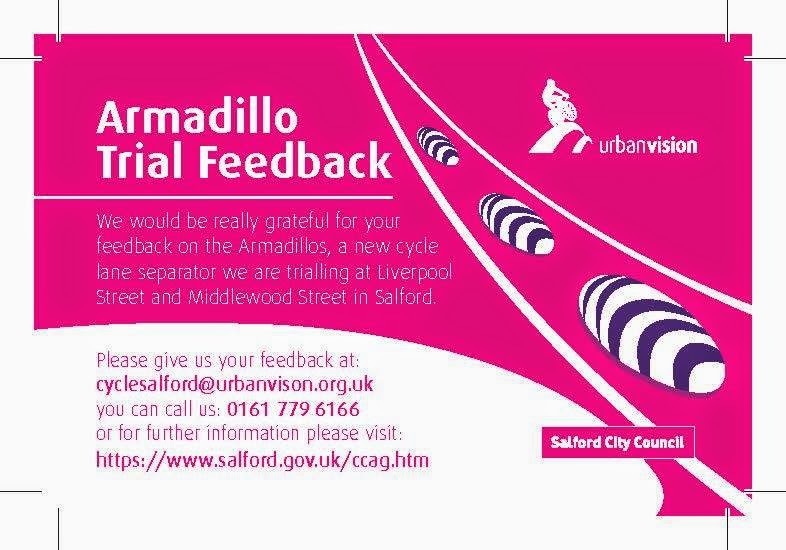 Last week Salford council carried out yet more changes to the armadillo trial on Middlewood Street and Liverpool Street, this time trying to protect the armadillos using Jislon plastic traffic islands. Segregated cycle lanes are an important part of delivering Salford's Cycle City Ambition Grant (CCAG) strategy. 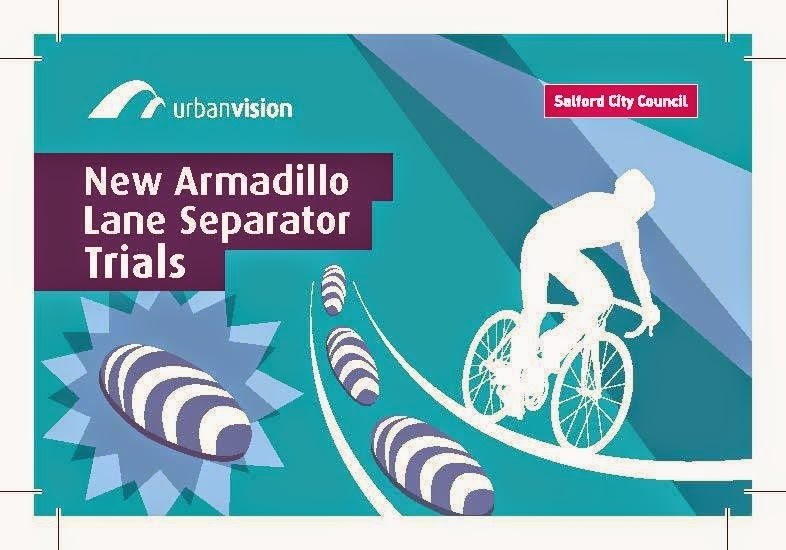 Following consultation with the Salford Cycle Forum, two trial sites have been implemented, to test a product which provides a semi segregated buffer between cyclists and general traffic. The separator is commonly referred to as an armadillo. The armadillos have been used successfully in Europe for a number of years, but they are relatively new in the UK. The trial sites are being used to test the concept of semi segregation using armadillos, prior to their potential wider use in the CCAG programme. The trial sites are being closely monitored, and may be refined as necessary following observations and feedback from users. Approximately 80 metres of semi-segregated cycle lane have been implemented on the westbound carriageway of Liverpool Road, between Albion Way and Cross Lane. Approximately 70 metres of semi segregated cycle lanes have been provided on Middlewood Street eastbound. The city council is very interested in receiving feedback on the trial sites from all users. This will assist the city council in evaluating the product, and influence how we progress with segregated cycle lanes in the future. Comments can be emailed to cyclesalford@urbanvision.org.uk or you can call on 0161 779 6166. The consultation period will run until Monday 5 May 2014. Official consultation on the armadillos is now under way. Info below should be self-explanatory but Lee is especially interested to hear how the spacing and angles of the armadillos works. If people put comments on here, I'll pass them on. Now before you compose your response it is worth considering a few facts about this "trial". To start with both these cycle lanes are substandard. They are only 1.5m wide which is the absolute minimum for a cycle lane, despite this being a very wide road. Cycle lanes should be 2m wide and segregated cycle tracks should be 2.5m wide. The first set of armadillos were installed at the beginning of February, and failed on Middlewood Street within a few days. This is similar to the experience in Camden, where armadillos and planters were soon damaged. The armadillos on Liverpool Street lasted a little longer, but were replaced within a month. The Middlewood Street Armadillos were replaced at the beginning of March, but this time parallel to the road so they were less likely to be dislodged by traffic. Indeed many drivers didn't even see them so ended up driving over the top of them. The Liverpool Street armadillos were replaced around a week later, but in the same configuration as before. Soon after two black bollards were added to try and stop people driving into the cycle lane, but the one in Middlewood Street was damaged within a couple of days. Undeterred two yellow bollards were added a few days later. These bollards have now all been removed following the extensive damage and replaced by the plastic traffic islands. So, what are we to make of this constant cycle of damage and replacement? Well, this seems to be the experience in the USA as well. 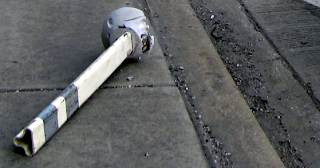 A fallen soldier on Milwaukee Avenue. Photo by John Greenfield. In the wake of this brutal winter, some sections of Chicago's Dearborn Street protected bike lanes resemble a gap-toothed grin. Several of the white, plastic posts that delineate the bi-directional bikeway are missing in action. Half of the posts that once shielded cyclists on Kinzie Street from auto traffic are gone. And on Milwaukee Avenue, a key route northwest from downtown and Chicago's busiest biking street, every single bollard is missing. Unsurprisingly, plastic is not a material that stands up to heavy traffic. Any cycle route that is "protected" by plastic separators of any sort will be likely to degrade within 12 months. If the budget is not available for continual replacement then these so called "protected" cycle facilities will soon revert to just ordinary cycle lanes. So do Salford Council propose to put aside guaranteed funds for the maintenance of these proposes cycle facilities? I very much doubt it! The armadillo is a rounded black plastic lump around 9cm high at the middle. Visually it is not much different to a cats-eye and lacks the visual significance of a kerb edge. Many people fail to see them at all. In the mind of a driver they do not clearly convey the message that this represents the edge of the road. As a result people drive into the cycle lane despite their presence. The armadillo's low rounded profile is little higher than a speed bump and can be driven over without causing damage to even the smallest car. Indeed the suppliers say this is one of their advantages. However it is a very dangerous obstruction for someone riding a bicycle, likely to throw you to out onto the road. Armadillos provide no protection from drivers parking in the cycle lane. Salford Council have tested these plastic armadillos in a location where there is no obstruction of the cycle lane by parked cars and HGVs. Armadillos are utterly useless in these sorts of locations because drivers will simply drive over them to park on the cycle lane. The armadillo used in Salford is made from amorphous plastic waste. It is less resilient to damage than fresh plastics. 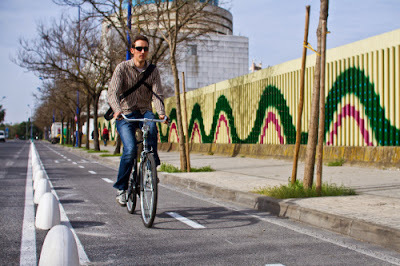 Seville's cycle segregation measures are nothing like the armadillo. They are a much higher concrete bollard, high enough to prevent incursion by motor vehicles and visually very clearly the edge of the road. These are known as "Tobys" and have been chosen by Bristol in preference to plastic armadillos. The web page instructions say "Comments can be emailed to cyclesalford@urbanvision.org.uk or you can call on 0161 779 6166." However, I would warn against only sending your reply to that email address, because Urban Vision Partnership Ltd. is not strictly Salford Council, but a "a joint venture between Salford City Council, Capita and Galliford Try." So I would suggest sending your reply to cyclesalford@urbanvision.org.uk and also to Salford Council, both to Salford's Cycling Officer lee.evans@salford.gov.uk and to Salford's City Mayor citymayor@salford.gov.uk - that way your reply is on the council's records and not just in the hands of a limited company. Salford's mayor's web site also gives a very prominant place to the consultation so he must be taking an interest in the results. So, get writing, remember it closes on the 5th May, and don't forget to tell the council where you live in the area and how often you cycle here. Crap Cycle Networks are... crap! Volunteers for committee roles please! 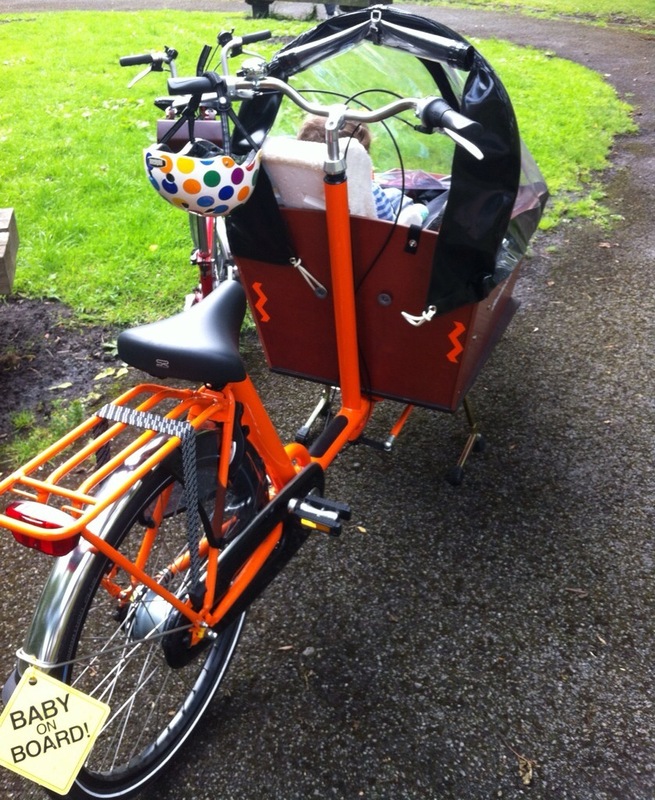 Cargo life, family cycling and quaxing! Park where you like? No Minister ! DfT's "Pennies for Cycling" campaign —you can help!